Note: This is a press style report of FUDCon APAC 2014, which summarizes the event highlights. Don’t miss the links to slides, videos, and photos! 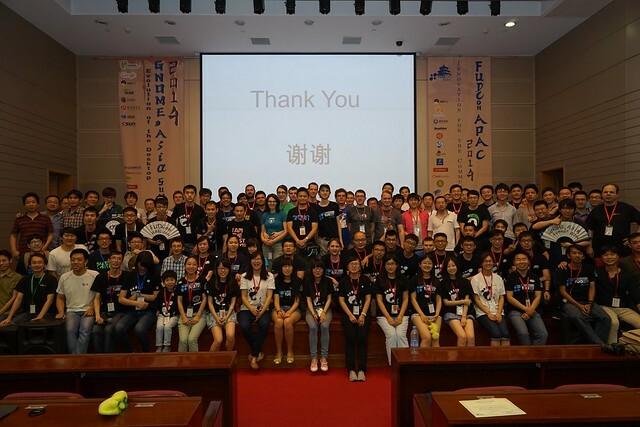 FUDCon APAC 2014 was successfully held at Conference Center at New Main Building of Beihang University, Beijing, China during May 23 to 25, 2014. This year the event was held together with GNOME.Asia Summit, an annual conference for GNOME users and developers in Asia. It turns out to be a rather exciting experience of mutually beneficial cooperation of free and open source communities. In total, GNOME.Asia and FUDCon APAC 2014 attracted more than 500 registrants, and among them over 300 attended the event. There were 52 speakers in total and among them 22 are for FUDCon. Thanks to the help with the community budget, many non-local speakers joined the event and made FUDCon Beijing a big gather up for the Fedora community. The speakers delivered a wide range of topics about free and open source technologies and communities presented in keynote speeches and five parallel tracks. Richard Stallman gave a keynote speech on Computing, Freedom, and Privacy, which is the favorite speech according to the feedback survey. Talks in FUDCon tracks cover various subprojects of Fedora, as well as new application introduction and community building discussion. The links to all slides are available at the wiki page. As for the videos, they are currently available at the GNOME.Asia channel on Youtube. The Fedora Videos team is working to make them available on Fedora channel. There were about 50 volunteers at the event. They were recruited from the local universities and companies. They showed great enthusiam and did amazing jobs to make the event well organized. Two of them, Tong Hui from GNOME and Zamir Sun from Fedora, were each awarded the prize of best volunteer, a hand fan full of wishes in various languages written by the attendees. It is worth pointing out that about ten percent of the attendees are women. Many of them are active volunteers and talented speakers. Still more women contributors are expected in free and open source communities. And there was a dedicated session, Fedora Women initiated by Nitesh, to discuss the issue and possible solutions. FUDCon is not just about technical sessions. It is also about meeting friends and having fun. FUDPub was organized as a welcome party, and there was a celebration party with delicious buffet on Sunday evening. On Saturday there were sports games including football, baseketball, and ping-pong. These social events helped the attendees enjoy the conference and the community. Special thanks go to the sponsors. FUDCon was sponsored by 7 companies and 5 local communities. The success would be impossible without their generous support. There were 14 booths for sponsoring companies and local communities at the joint event. Attendees enjoyed hanging around the booths for discussion, and many swags were distributed at the booths. Photos and Reports from various attendees are aggregated on the wiki page. The FUDCon Beijing Badge has been created and is in the process of collecting FAS usernames at the current writing.